We are the renowned manufacturer, supplier and exporter of a gamut of Metal Sheets. These metal sheets are manufactured using high-grade metals procured from reliable vendors. The entire range of metal sheets offered by us is widely applauded among the huge client-base spread across the globe. Our Tile Profile sheet offer excellent aesthetics without compromising the traditional look . Unlike slate tiles . It is a seamless product which enables easy fixing . Color Coating improves the aesthetics and the metallic coating offers CORROSION & BARRIER protection againgst extremities of weather condition . 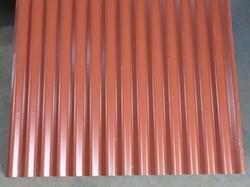 Our Corrugation profile sheet is a cost effective solution for roof / wall caldding application . It is a sinsoidal wave profile having traditional and contemporary design. Color Coating improves the aesthetics and the metallic coating offer CORROSION and BARRIER protection againgst extremities of wheather condition. Fixing is very simple and easy to align . We produce UPVC roofing sheets with advanced technology of manufacturing and providing best quality and performance of the roofing product. This UPVC roofing sheets are the best option to metal G.I. sheets, ceramic sheets and fiber glass sheets. It comes with sound insulation, heat insulation, chemical resistance, fire retardant, water resistance, eco friendly , light weight so easy to move and install and cost effective in installation so you can save construction cost up to 70%. Laying of Purlins: Fix the bottom purlin fiest. The roof truss structure adopts sectional steel or wood as purlin, the purlin is required to be flat without deformation, and two purlins must be in parallel with uniform span. Wind Load: uPVC roofing sheets (2 mm) can withstand a load intensity of 220kg/sq, mtr with our showing any structural distress of failure prevailing winds. Curved Roof: When the frame design is established, continuously setup the lines courses to get the right positions of purlins, Sunarch uPVC roofing sheets (2 mm) are recommended for curved structures with minimum radius of 3mtr.on 12 feet. Anti-oxidants modifing agents and UV Stabilizers gives very High service life. 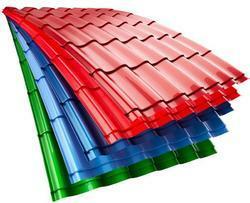 Sun-arch uPVC Multilayer roofing sheets has Excellent heat insulation property and anti-corrosion capacity. Very good at Acid alkali resistant. High impact strength due to integration of impact modifiers. Easy process for nailed, sawed or cut. Low structural cost as Multilayer uPVC roofing sheets is Light weight. 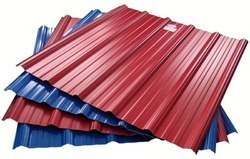 We specialize in offering an extensive range of Roofing Sheets, which is widely used for cladding walls and roofing as well. Resistant to corrosion, these offered sheets are widely acknowledged among the huge clientele client-base we have accomplished to reap so far. Durable in their characteristics, these offered metal sheets are highly popular among the clientele we hold. Looking for Metal Sheets ?